Is There a Difference Between “Wanting” and “Needing”? Serotonin Plus Blog Is There a Difference Between “Wanting” and “Needing”? One of my children, when very small, used to make me laugh lots with a line he used around the age of 2. We would be in a grocery store, he would see some sort of candy or treat item, and he would look at me in an imploring manner and say ‘I need this”. When I would asked him why he “needed this” the explanations were really cute. Concerning “wanting”, we all want LOTS of things, but do we truly NEED these? Do we really need that 4th television in the house? No, we may want this added big screen. Is there truly a need for a luxury car or do we really just want one. Let’s move away from 2 year olds (and adults acting like 2 year olds, such as me when I go to a Big Screen Store or car dealership) and focus on adults trying to control weight. There will be plenty of food and drink items that we actually need vs. the ones we really want. Distinguishing the two and thinking about this may help govern our decision-making when we shop and/or eat. For example, we truly “need” water to survive. We also need a certain balance of food groups and vitamins to maintain health. However, we want lots more than the essential foods and drinks that we need to maintain good health. Take the time to write out a list of the derailing food and drink items that have historically been barriers to your own weight control efforts. Try to come up with reasons for each one why you need this. As an example, perhaps those 2 glasses of wine are needed to wind down and fall asleep. Maybe, switching to a Tylenol PM may be a great alternative to not hurting your weight control efforts. 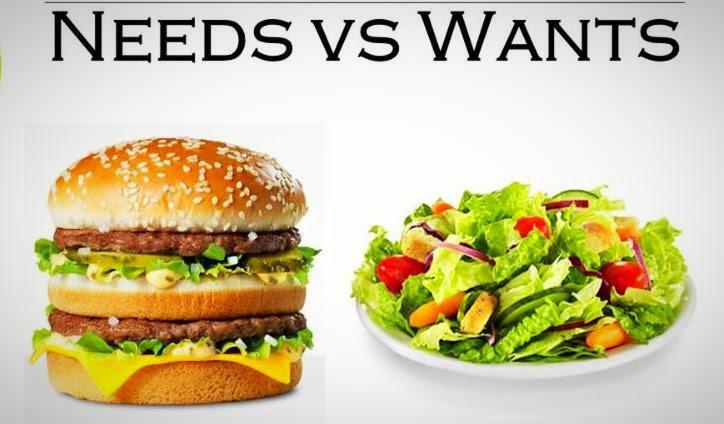 Perhaps, by identifying the “needs” from “wants”, you can do a better job at avoiding some/all of these derailing food/drink choices.